In other words, words which the President also spoke on another occasion, "you didn't build that." The rhetoric is stirring for many who heard his words, to be sure. What's more, Mr. Obama is entirely correct. But he is also entirely mistaken. The President is correct to note that individuals acting alone are virtually impotent. At least since Adam Smith's Wealth of Nations published in 1776, thoughtful people have understood the power, productivity, and efficiency of specialization and cooperation. College freshmen routinely learn about Smith's example of the pin factory. Yes, insomuch as Mr. Obama understands Adam Smith's lesson about specialization and cooperation, he is entirely correct. I have always considered it an interesting coincidence that in 1776 when Thomas Jefferson and the other Founders wrote about inalienable rights and voluntary cooperation --- political freedom --- Adam Smith was also writing about how voluntary exchange leads individuals to cooperate without compulsion, resulting in splendid and unmatched prosperity for the members of a free society --- economic freedom. But just as surely as Mr. Obama is entirely correct about the power and productivity of cooperation, he is entirely wrong about how free individuals come to cooperate. Mr. Obama believes it is the state and its power of taxation under threat of force that is the blessing of individuals living together in a society. For Mr. Obama conflates government and society. Obama mistakes government for society, and in that premise he is utterly wrong. Government is not society. Individuals in free association, engaging in voluntary exchange free of compulsion, are society. Government is the antithesis of freedom, the antithesis of voluntary exchange, the antithesis of moral human conduct, for government is the penultimate coercer of humans, and coercion of one by another is immoral. One person compelling another is immoral, and 545 people compelling millions is also immoral, notwithstanding the imprimatur of majority rule. It does take a village for humans to prosper. But a village is not a government. A village that is moral and prosperous is an association of free individuals who do not compel one another, but instead engage in voluntary exchange --- in a word, in capitalism. Mr. Obama made his intentions for the next four years about as clear as he could, while still confining his language to the rhetoric of speech writers composing for a politician. It is unfortunate that the President and his supporters seem to understand only part of what Adam Smith and Thomas Jefferson had to teach us. Here, George Melloan explains in clear terms how economic reality will have its day, notwithstanding the machinations of politicians. Dare I repeat an old message in this blog? "You can't borrow what hasn't already been produced and saved." On January 1, 2013, Congress and President Obama approached the fiscal cliff, looked over and backed away. 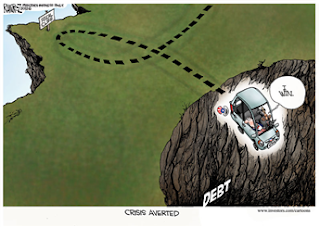 But as the nearby cartoon depicts, the cliff didn't go away. Everyone knows that the next few weeks will feature rancorous debate in the halls of Congress and the media, lots of blame-game finger pointing, and an ultimate showdown over raising the federal debt ceiling. Obama's recent declaration that he refuses to negotiate about raising the federal debt ceiling is simply political bluster embedded deeply in political theater. In the end, Congress will raise the federal debt ceiling, just as it always has. In a more distant end --- but not an end out of sight --- entitlement programs (Medicare, Medicaid, and Social Security) will be altered as needed to kick the can down the road, as they say. And of course, we will all pay higher taxes --- if not higher tax rates. A very small percentage of folks called "the wealthy" will begin paying higher tax rates almost immediately. Given a bit of time to adjust their affairs, "the wealthy" will end up paying about the same or even less in actual taxes as they now pay. The rest of us will pay higher taxes soon enough due to provisions buried in Obamacare, notwithstanding the President's promises that we wouldn't. But thoughtful people have known that for a long time. We all know there really is no such thing as a free lunch, right? Most everyone I know is worried about our ever-rising federal debt. Some of them are CPAs. Some of them have Ph.Ds. All of them are good, intelligent people. According to one readily available debt clock, the current deficit tops $1 trillion and the level of our national debt exceeds $16 trillion --- more than our nation's annual GDP. That would seem a bit worrisome. The rate of growth of our national debt (the ever-increasing annual gap between federal spending and tax receipts) and the awesome size of the national debt are worrisome, to be sure. But most people are worried about the debt and rising annual deficits for wrong reasons. Many folks are worried about the burden that paying back federal borrowing will impose on our children and our children's children. Still others worry that our current national consumption largess, spurred on and augmented by entitlement spending, necessarily means reduced national consumption in the future. Some people worry that the Chinese and Japanese --- two of the largest groups of external holders of U.S. Treasuries --- will end up "owning" us. If true, these outcomes would certainly be worth worrying about. But they are not true. Our children and their children will not be burdened by paying back our federal debt. After all, are we currently burdened by paying back that portion of the federal debt we inherited? Not a bit of it. We haven't and we won't pay off the federal debt. Annual deficits that we are adding to the the debt won't be payed back by our children, any more than we are paying back debt we inherited. That's just an empirical observation that happens to be the case. Explaining how this non-payment can continue indefinitely is a bit complicated, so just trust the history. Trust that America is not Greece and never will be. We Americans are consuming enormous quantities of goods and services currently. But we are not consuming goods and services that would otherwise be available to us in the future, and we are not consuming "beyond our means." No one can consume beyond one's means, pretty much by definition. For the most part, we are consuming only those goods and services that are being produced right now, either by we ourselves, or by others around the world. In fact, we can consume only goods and services available right now; we really don't save up goods for future consumption, and services can't be saved at all. Our future consumption possibilities will depend on future production that we or others around the globe accomplish in the future. Future production possibilities at home and around the globe will depend mostly on the rate of technological advances, just as they always have. Consequently, we need not worry about our future consumption possibilities, unless something we are doing today is retarding the advance of technology and the formation of what economists call "capital goods." Capital goods are machines, tools, and infrastructure in which we embed our technology. Capital goods are what makes us humans more productive. Without capital goods, we are essentially the same sort of humans that have been around for centuries. Yes, some people know more these days than people knew centuries ago, but that's just part of advancing technology embedded in some of us --- what economists call "human capital." We might be a bit taller and a bit stronger, but that's mostly due to better nutrition, due of course, to better technology --- notably, the agricultural revolution and the industrial revolution. The Chinese and the Japanese will not own us. I doubt that they want to own us, even if they could. But won't the Chinese, the Japanese, and other persons who have bought U.S. Treasuries demand to be paid back with interest due? Yes, but we need not worry about that. Suppose they demand to be paid back in pictures of dead U.S. presidents. What then? No problem. The Fed can and will generate all the pictures of dead U.S. presidents anyone cares to hold. Such pictures, after all, are only slightly more substantial than the zeros and ones in computers that currently signify external ownership of U.S. Treasuries. What if "dem ferners" demand to be paid back in real stuff --- real goods and services? What then? No problem. We Americans would simply have to produce real goods and services, which we can and will do as demanded. Presently, the Chinese and Japanese appear to be more interested in producing stuff for American consumption. But just think of all the jobs that future American production would generate, should the Chinese and Japanese want real stuff! Actually, all that production wouldn't come mostly from labor. That expanded production would come mostly from application of advanced technology embedded in capital goods --- machines and know-how. That is simply an empirical observation; it's what's happened throughout all of history. The ability of ever advancing technology to enable ever greater production of goods and services with ever diminishing quantities of human labor shows absolutely no signs of going away. That fact is all that's ever saved us from our own political folly. I predict it will save us again. Still, rising annual federal deficits and the expanding national debt that results are worrisome. But the real problem with rising annual federal deficits and expanding federal debt is expanding federal government. Expanding government could very well be what retards advancing technology and capital formation that our future consumption possibilities definitely require. By far, most dollars spent by the federal government do nothing to advance technology or grow our stock of capital goods. In fact, something around 60 percent of federal expenditures are transfer payments --- Social Security payments, Medicare payments, and Medicaid payments --- to name the big dogs. Transfer payments are dollars extracted from Peter to pay Paul. Transfer payments are not necessarily bad. After all, most recipients of Social Security did pay FICA taxes all their working lives. But regardless of the just desserts of any particular transfer payment, they do not usually enable advancing technology or capital formation. Worse still, much of the 40 percent of government expenditures that are not transfer payments may actually impede the advance of technology and capital formation. Regulatory burden (Dodd-Frank, to name but one example), misallocation of resources (the housing bubble, to name the most recent example), subsidies to inefficient businesses (ethanol in gasoline, to name a particularly egregious example), and waning entrepreneurship (the Y generation, to name a cultural example) all have the definite potential to retard advancing technology and capital formation. Most thoughtful people understand that some government --- even some federal government --- is desirable. We all want national defense (at some level), police, firemen, courts, roads, and bridges (provided they go somewhere). We all want to extend a helping hand to people who really need it. I haven't heard too many folks complain about federal dollars spent to help victims of hurricane Sandy recover, and I haven't heard much complaining about Medicaid, many of whose recipients are children. But the merit of these few, limited roles for federal spending in no way justify or excuse the Ponzi scheme called Social Security, militaristic intrusion around the world that keeps the military-industrial complex alive and well, and the ever-advancing expansion of the welfare state. Let's face some simple facts. Federal spending must be financed in one of four ways: taxes, borrowing, fees, or money creation. Of the four, many politicians prefer borrowing, for fairly obvious reasons. Borrowing seems to be getting something for nothing, which explains politicians fascination with federal debt. The method of financing government expenditures is actually fairly innocuous, compared to the real problem, which is placing control of scarce resources in the hands of government operatives. Taxing to finance the same level of federal spending we have today (about $3.5 trillion per year) would be every bit as worrisome as borrowing to finance. Of course, taxing instead of borrowing would tend to limit government spending, simply because people notice and object to taxes more than they notice or object to borrowing. But in the end, taxing to finance federal government spending has pretty much the same effects as borrowing. The main difference is who bears the immediate incidence of federal spending and who bears the long-term burden. Short-term incidence of government finance has to do with whose income pays for government spending immediately. Long-term burden of government spending has to do with whose consumption opportunities are diminished in the fullness of time. Incidence and burden of government finance change over time, as people adjust their behavior to government spending and the method of financing government spending. The true incidence and burden of government finance are difficult to track, regardless of whether financed by taxing, borrowing, or outright money creation. But tracking the incidence and burden of debt financing and finance by money creation are much more challenging than tracking the incidence and burden of financing with taxes, which goes a long way toward explaining why politicians favor debt financing so much. Everyone knows that money creation at too fast a clip --- a la the Fed --- is a really bad idea. Just ask the Germans or the folks in Venezuela. But slow-paced money creation isn't as serious --- certainly not a game-stopping problem. In fact, some economists believe that a mild rate of inflation --- money creation --- is preferable to zero inflation, and certainly preferable to deflation. The Board of Governors of the Fed certainly believes that proposition. As it happens, money creation proceeds through federal borrowing, as students of money and banking know. If the U.S. Treasury sells bonds directly to the Fed or some government agency (like the Social Security Administration), the U.S. Treasury is the first and immediate spender of the new money. That's definitely a worry, but mostly because it places scarce resources in the hands of government operatives (operatives who produced nothing of value to get the new money and who will not pay a cost if they spend the money badly) instead of in the hands of private citizens. If the U.S. Treasury sells bonds to anyone other than the Fed or another part of the government, the results are more convoluted. But regardless of who first spends new money, if the rate of growth of new money exceeds the rate of growth of production of real goods and services, the end result is inflation --- an increase in the average of all prices sustained over a long period of time. In America, the long-term rate of inflation has averaged somewhere between 2 and 5 percent per year for many years. The real burden of the debt --- the real reason we should worry --- is the transfer of the use of scarce resources from private hands to the hands of government operatives. As Milton Friedman noted, no one spends the money of someone else as carefully or efficiently as we spend our own money. That proposition seems especially true of government operatives and the 545. The real problem of financing government spending by borrowing can be summarized as (1) placing bountiful amounts of scarce resources in the hands of government operatives who are not accountable for their decisions (our getting to vote every two or four years does not yield accountability, obviously), (2) obfuscating who is paying for the spending immediately and who bears the burden of reduced personal consumption due to the transfer of scarce resources, and (3) the reduction in technological advances and capital formation that results from transferring scarce resources away from private decision making to decisions made by government operatives and the 545. The real problem and worry about the annual federal deficit and the growing national debt is the government spending the debt permits. The problem and worry would be pretty much identical if the same level of federal spending were financed by taxation. Readers of this final summary statement will find themselves in one of three groups, more or less: (1) those who agree, (2) those who disagree, and (3) those who don't know whether to agree or disagree. Pick your group.